First ensure it really is hormonal acne. Generally hormonal acne shows up on your chin, jawline and neck or flares up before or during your period. Start using a gentle cleanser and only wash your face twice a day. Washing your face too much can cause it to dry out. Never go to sleep with makeup on because it will clog your pores and could cause acne. After you cleanse your face, use a topical acne treatment. Next use a moisturizer but make sure it is oil free and only use it on the driest areas of your face. 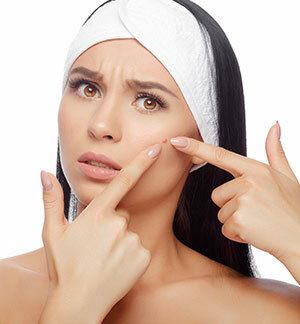 Bacteria and inflammation are two of the top causes of acne. Get some good bacteria in your system to help balance the bacteria out. Try taking a probiotic supplement or eating more yogurt with live, active cultures. Probiotics can ease inflammation in your gut that can heal many problems, including acne. Talk to your dermatologist. They may be able to prescribe you a stronger acne medication or give you tips that are specifically designed to help your individualized skin. Get a facial. They may also be able to help you design a specialized skin care regimen to help heal your acne problems. Peels can be very helpful in getting rid of dead skin cells that clog pores. Changes in your diet can greatly help heal acne, especially hormonal acne. Try eliminating sugar, dairy and gluten for a few weeks. Then start to add certain things back into your diet to see what has been affecting you. Exercise more and stress less. Exercise can boost circulation which can help reduce skin inflammation. Less inflammation means less acne. Stress can also cause those annoying flare ups. Try adding meditation, massage, yoga or simply more time for yourself to relax. Do you have hormonal acne? Do you get pimples every month right around your period? Let us know if some of these tips help you!